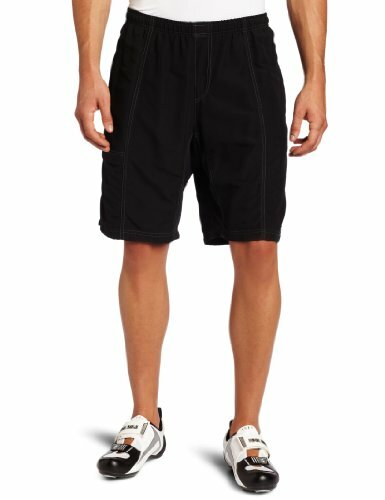 The Canari Cyclewear Baggy Padded Cycling Short for Men is a nice and stylish wear for serious bikers. It is tailored using the revolutionary Canari gel pad – a technology designed to deliver unparalled performance and a perfect function. The gel works to eradicate seat pressure, unwanted stress to the nerves and also absorbs part of the shock and scuff from bumpy rides. The material is one hundred percent fusion of nylon and spandex and comes with a pocket properly positioned on each sides and one on the leg with a closure made from Velcro. The shorts are breathable to provide for some cooling and the waist adjustment is done with elastic bands. Outer shell material made from one hundred percent polyester while the inner liner is made from ninety two percent polyester mixed with eight percent spandex. Comes with a pocket each on the sides and one leg pocket for keeping small items such as phones and portable music players. Employs an elastic waist cord for size adjustment and proper fit. The Canari Cyclewear Baggy Padded Cycling Short for Men is a decent bike short that comes with nice features. The material is of high quality and it is well tailored to provide a comfy and casual look. It comes with enough gel padding that offers adequate comfort for longer rides and they seem to offer some resistance to shocks from bumpy roads. On the flip side, they are a bit heavy and very warm. They are not suitable for use on hot days as they tend to make you feel sweaty on long rides. It has pockets properly sewn and fitted and this comes very handy for keeping small sized items such as phones, keys, etc. If you want a multi-purpose padded short for biking and casual looks then it’s recommended you give the Canari Cyclewear Baggy Padded Cycling Short for Men a try.